Abasteron House is a dark tale. We begin with the shy light of a girl under a beachy summer sun. We end in the purple of the bedchamber, a women in her dream, darkness filled and winged. All that we see or seem is but a dream within a dream. Most recognize this line from Edgar Allan Poe’s famous poem “A Dream Within a Dream.” Literary experts debate the poem’s full intent, but many can agree Poe is saying all is an illusion—all we see here and all we seem to be. Really? Illusion versus reality. What a haunting dilemma. Imagine you are Davida Kip Livingston, a young artist, just an ordinary girl, living with your grandfather in Abasteron House by the sea. Grandfather is a dear sweet man who loves poetry and mythology and prefers to sit for long hours locked inside his attic study. But what he sees versus what he seems to be is no dream within a dream. Listen outside Grandfather’s attic door and hear the maniacal scratching; imagine a bitter claw ripping into your flesh. Is there a growling now? Is that the flap of a winged beast? Davida wants to know what’s living inside Grandfather’s attic. Do you? Abasteron House is published at Every Day Fiction in the March issue. The story is flash fiction (1000 words). The author is not a dead author like the other 19th- and 20th-century horror writers featured on this blog site. The author is me, Paula Cappa, and Abasteron House is the prequel to my novel Night Sea Journey, A Tale of the Supernatural, where Davida Kip Livingston lives through the horror in Abasteron House. I love to hear comments from my readers, so please dash off a word or two if you enjoyed Abasteron House. Stop back next Tuesday for another Tale of Terror. Follow me here, on Twitter or Facebook. Look in a mirror. What do you see besides your own reflection? A hypnotic pair of eyes staring back or a deep magnetic attraction? Let’s say this reflection holds a secret, a consciousness inside the expanse of glass. Might there be an apparition there? A rival? Phantoms? In the Mirror was written by little known author Valery Brussof (1873-1924), Russian poet, writer, and scholar, embracer of Bolshevism, and leader in the Russian symbolist movement during the Silver Age. He is remembered for his horror novel The Fiery Angel, a 16th-century romantic drama about the passionate Renata and her sexual and spiritual occult practices. While superstitions and folklore abound about mirrors bringing bad luck or telling the future, Brussof doesn’t go that route. We are clearly in the present harsh light of reality. He writes this story with subtle atmospheric technique, as we are dragged into the mysterious abyss of a reflected and fragmented universe. Vanity is a favorite sin. And so it is with our character, a daring woman of beauty who loves mirrors but weeps and trembles as she discovers the mirror’s truthful depths. We are in December, the winter dawn, when a confrontation manifests between this woman and the image she finds inside her mirror. Consciousness is a strange energy—pale, half dead, a burning-icy feeling that may very well breathe darkness into the soul. Read In the Mirror here curled up in a gloomy corner with moonlight bending the window glass, maybe a flute of potato vodka at hand and a bit of zakuska (delicate meat-filled pastries). Escape with Valery Brussof. I’d love for you to leave a comment. Stop back next Tuesday for another Tale of Terror. This little poem is attributed to Jack the Ripper, reportedly written in 1888. 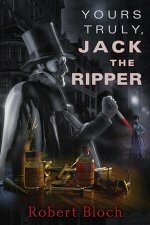 We all know Jack as the elusive madman who butchered five prostitutes in the Whitechapel section of London. Jack’s narcissistic blood lust will forever haunt us. The Ripper disappeared quite suddenly in 1888, leaving the London police completely baffled—and history to guess about his identity and destiny. Scotland Yard presumed Jack died suddenly since the brutal murders did stop … or did they? Robert Bloch, author of the novel Psycho, 1959 (Hitchcock made it into the famous film) can further chill our dark curiosities with his short story, Yours truly, Jack the Ripper. Here is the premise of Bloch’s story. What if … Jack is still alive today? What if … by some magical black art, the Ripper offered his victims as blood sacrifices to the eternal dark gods and—incorporating lunar rhythms of power—Jack was granted eternal youth? Ahaa, you say? The killer immortal? Let’s reach out and suspend disbelief. Meet American psychiatrist John Carmody, living in Chicago. He encounters Sir Guy Hollis of the British Embassy, an esteemed and distinguished stranger in town. What, were not in the drabs of London in the 19th century? We are not. We are in the Windy City, 1943. Block writes a highly readable narrative with lively dialogue and a fast plot. The Chicago streets shiver with fog, lurking shrouds, and shadowy alleys. Dreaded fears mount at the corner of Twenty-ninth and South Halsted. And here’s a bonus, Boris Karloff’s Thriller Theatre presented a film of Bloch’s short story. Watch it here (about 50 minutes), done in black and white and deliciously vintage. Do leave a comment. Even a two-word review will do. Are you drawn to haunted house stories? Would you consider living in one for just the experience of meeting a ghost? Edith Wharton’s Afterward is a haunted house story, but it’s got a different spin on the old cliche. Come to the House at Lyng in the countryside of Dorsetshire, “known to be full of ghosts.” Mary and Edward (Ned) Boyne move to Lyng because it’s so remote and because it has a resident ghost—a predictably shy ghost. How delightful, right? But this story doesn’t start off as juicy as you’d expect: there are no ghoulish stories about this ghost at Lyng, no historical facts to feast upon, no frightening legends. Darn! Wharton is such a tease. She is a writer that likes to turn the tables on what the reader expects in the traditional ghosts of evil doings and hot revenge. Mary finds the House at Lyng quite enchanting with English gardens, grass terrace, fish pond, drawing room, and library. The couple have no financial worries due to Ned’s highly successful business dealings. Wharton describes the house meticulously and with elegance … the pear trees drawing complicated patterns on the walls, pigeons on the silvery slated roof, tea at breakfast from a charming Edwardian teapot. Isn’t life lovely! But where is this ghost and why isn’t it haunting? Soon after, Mary finds that Ned doesn’t join her for luncheon … or dinner. This is a ghost story that hinges on old money, the old aristocratic values, and another driving desire—greed. You can be sure this ghost is a clever power. I began to wonder if the ghost was secretly watching, waiting for the just the right moment to strike. I was wrong, but far from disappointed. You’ll find this psychological ghost story will keep you turning the pages as Afterward will haunt you with a last faint breath. P.S. Click on the tab above, Short Stories, to experience my latest supernatural tale just published at Fiction 365, Hildie at the Ghost Store.